Researchers, including the ICN2, have now developed uniformly nanoporous graphene as part of a national research collaboration in Spain. A significant step in graphene research, it will help us to explore the full potential of the material in electronics, filtration and sensing applications. The research was presented at a press conference at the Barcelona Institute of Science and Technology. 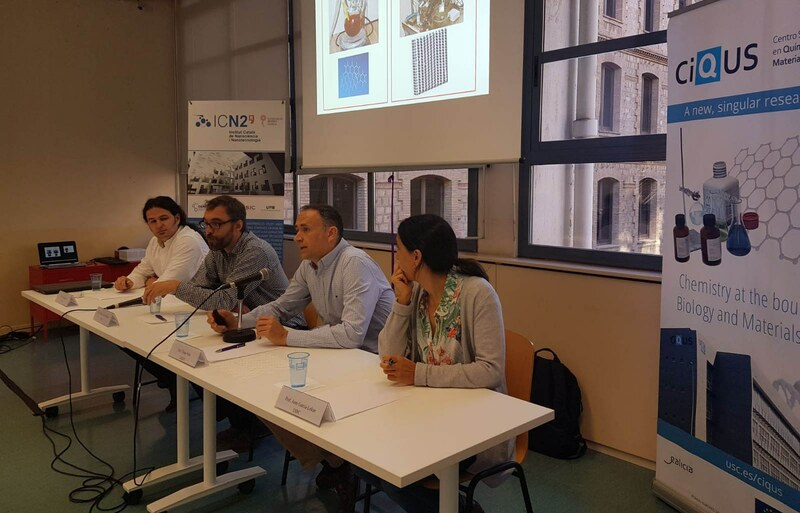 The team included researchers from the Catalan Institute of Nanoscience and Nanotechnology (ICN2), the CiQUS research center (part of the University of Santiago de Compostela) and the Donostia International Physics Center. They were led by ICREA Professor Aitor Mugarza (ICN2) and Professor Diego Peña (CiQUS), with Dr. César Moreno (ICN2) as the first author. Together, they have successfully created a graphene membrane; the pores of which can be tuned with atomic precision at the nanoscale. The ability to alter graphene pores can completely change the properties of the material. By manipulating them, the graphene membrane becomes permeable, which potentially opens doors in the future for using the material as a filter. Tied-in with graphene’s other properties, such as strength, it would be extremely energy-efficient and resilient. It would be an effective filter for a number of things, from greenhouse gases to biomolecules. Additionally, when engineering the pores, the spaces between them decrease to just a few atoms, transforming graphene from a semimetal to a semiconductor. This would allow it to be used in electronic applications and potentially replace silicon components, which are bulkier and more rigid. However, to produce this material, fabrication methods need to become significantly more precise – manipulating a material that is one atom thick is incredibly difficult. In this study, the team used a ‘bottom-up’ approach to create the graphene with the nanopores, using the theories of 2D polymerization molecular self-assembly. Using the approach found in this study, a precursor molecule is needed as the initial starting point; designed to behave as predicted with certain stimuli. These precursors were produced and designed by synthetic chemistry specialists at CiQUS. They were then taken to ICN2 for ‘bottom-up’ assembly to create the nanoporous graphene. The ‘bottom-up’ method involved several rounds of heating at high-temperatures while placed on a gold surface. This catalyzed the reactions which polymerized the molecules and formed ‘nanoribbons.’ The nanoribbons then bonded laterally, creating the 2D ‘nanomesh’ structure that had evenly spaced and sized pores. The graphene produced is a new version with electrical properties similar to silicon, that can also act as a highly-selective molecular sieve. These two features combined will allow the development of filter and sensor devices, which will sort and block or monitor the passage of molecules through the nanopores using an electric field. These electrical readings would provide additional information, depicting what concentrations of molecules are passing through the pores and when. This could also help to develop more efficient DNA sequencing. Some of the applications of a nanoporous graphene membrane range from pollution monitoring/mitigation to water desalination. There could also be applications in biomediciene, where these membranes could help to support failing organs.